A cool and cloudy day with the possibility of light rain is expected Monday across the Rio Grande Valley, according to the National Weather Service in Brownsville. 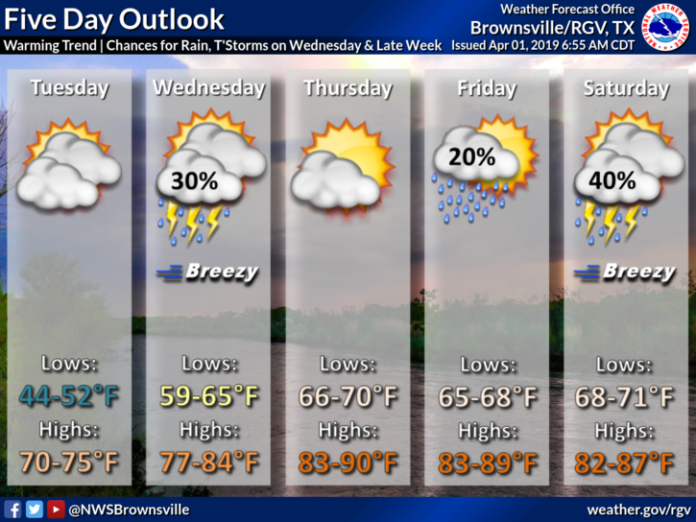 Brownsville is expected to reach a high of 61, and McAllen will be 62. Looking ahead, temperature will warm up throughout the week. There is a chance for rain and thunderstorms on Wednesday and Saturday. On Tuesday, lows will range between 44 and 52 degrees and highs will be in the 70s. On Wednesday, highs in the low 80s are possible. By Thursday, temperatures could be in the upper 80s.